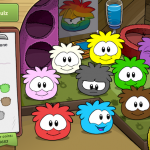 The Puffle Quiz is to help penguins decide which Puffle is best for them. 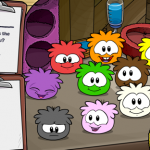 It will ask several questions that are different each time, and based upon the answers, will suggest which Puffle color to adopt. 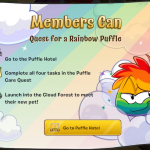 On May 30, 2013 the adoption station was given a slight update for the Rainbow Puffle. I remember I got white..